Maybe he’d be pleased to learn he was wrong, but the surprise here isn’t that Groundhog Day (adapted by Danny Rubin from his own 1993 screenplay) is good, or even how good it is. It’s how much Rubin, director Matthew Warchus, and composer and lyricist Tim Minchin were able to mine from an existing story, making it richer and stronger in the process. The film took its premise at face value: What would happen if someone lived the same day over and over? The story was the inexplicable phenomenon itself, reduced through a comedic filter. The musical is still more a comedy than not, but the rare kind that packs substance into each scene, able to let humor live side-by-side with passion, or tragedy, or a deeper hope. That is some of the genius of Rubin’s reworking, which manages effortlessly to ask probing, personalizing questions of the narrative that were otherwise absent in the film. There are darker parts inherent in the story’s premise (as there were in the film). The hell of indefinite repetition, the kind of romance that could exist, the push for self-improvement—but in the movie, these were devices used mostly to flesh out the comedy, to keep it from flat-lining. On Broadway, Rubin turns them into richer, fuller pieces of the narrative, using drama not as seasoning but as a main ingredient. He gives his characters the same enriching treatment, adding depth in unexpected moments. Ned Ryerson (John Sanders), once the redundant comic relief, now brings easy dialogue to a halt with heartfelt reflections on his late wife. Town drunks Gus and Ralph (Andrew Call and Raymond J. Lee) lament in an all-too-real way their drinking habits and their lack of power and voice in the world. And at the other end of the spectrum, Phil Connors himself (Andy Karl), less harmless and more insecure than in the film, displays an unsettlingly predatory attitude toward women that is harder to ignore when wielded by a more lifelike character than Bill Murray’s portrayal. This makes the lead character sound hardly palatable (and in truth they may have gone a bit too far with it), but it also raises the stakes to a level the film’s playful approach could not match. In the first act, Phil is unlikeable in a way that makes his gradual turnaround in the second more meaningful. There are many instances like these, poignant or disturbing moments that steer the audience away, suddenly but not jarringly, from any expectations they might have had about a shallow adaptation. Rubin is careful with his pace here, revealing just enough in flash glimpses to let the audience know there is more here, and still more to come. If that pace ever stumbles, it’s with Nancy Taylor (Rebecca Faulkenberry), the “pretty but naive one” whom Phil tricks into a one-night stand. She opens the second act with her own song, “Playing Nancy”, with the actress breaking character and speaking directly to the audience about her desire to be more than “just a detour on the journey of some man” — then actress and character spend the rest of the play largely in the background. Without more development in her own story, her song, already a little too unsubtle, becomes an unfulfilled promise. While Groundhog Day does much to separate itself from its predecessor, it doesn’t shun its cinematic roots. Director Warchus makes excellent use of the five turntables on stage to give certain quick, repeated scenes a movie-like montage feel, complete with camera panning effect. One memorable scene uses miniaturized set pieces on poles to turn the perspective ninety degrees, giving the audience an aerial view of a police chase — though this could benefit from a little polishing. 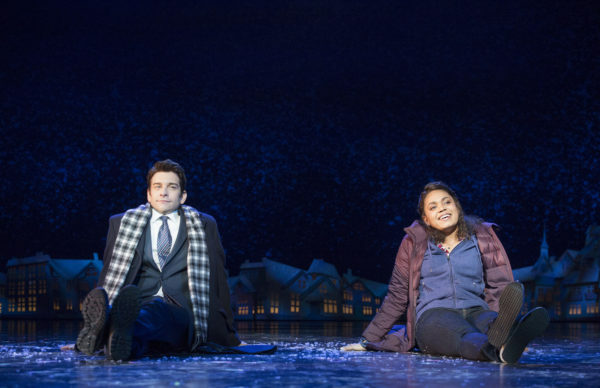 And a clever use of body doubles allows for abrupt time resets during the song “Hope”, transporting Phil seamlessly across the stage in the middle of a lyric. This last song, incidentally, summarizes the comedy-tragedy dichotomy of this musical better than any other. “Hope” is Phil’s perverse entreaty, in the darkest period of his time loop, that one should keep pursuing suicide in the face of repeated failed attempts. It would be a mistake not to mention the “poorly landed leapfrog” (in Karl’s words) that took him out of the show for several performances in its opening week. His torn ACL in his knee stopped the show during the Friday night preview about fifteen minutes before the end, when a calm-sounding stage manager asked if there was a doctor in the house. It didn’t stop Karl entirely, though. He insisted on finishing the night’s production, limping on stage with a cane to the roars of the audience. Those last fifteen minutes included the incredible “Seeing You” number, Phil’s final acceptance of what has been his life now for years, and the understanding that he can still experience things – and see those close to him — “for the first time”. It’s a song made all the more haunting by Rubin’s estimations since the film that the time loop would have lasted anywhere from ten to 100 years. It’s still unclear when Karl can fully return to the show, but hopefully soon. The show deserves him as much as he deserves the show, if for no other reason that his surprising ability to take an established role and make it very much his own. Groundhog Day is Rubin’s great coup: taking an existing story thought to have been told to its fullest and carving out so much more, exposing all its hidden intricacies. As Sondheim implied, the original was enough — Dayenu! — but two decades later, Rubin insisted on showing us that there was more.